For days, and I mean D-A-Y-S we have been singing "Everything is Awesome. Everything is cool when you're part of a team. Everything is Awesome when you're living a dream!" Basically, my boys are obsessed with The Lego Movie. They would watch it everyday if I allowed them. As it is I have to listen to them singing the song and quoting the movie constantly. 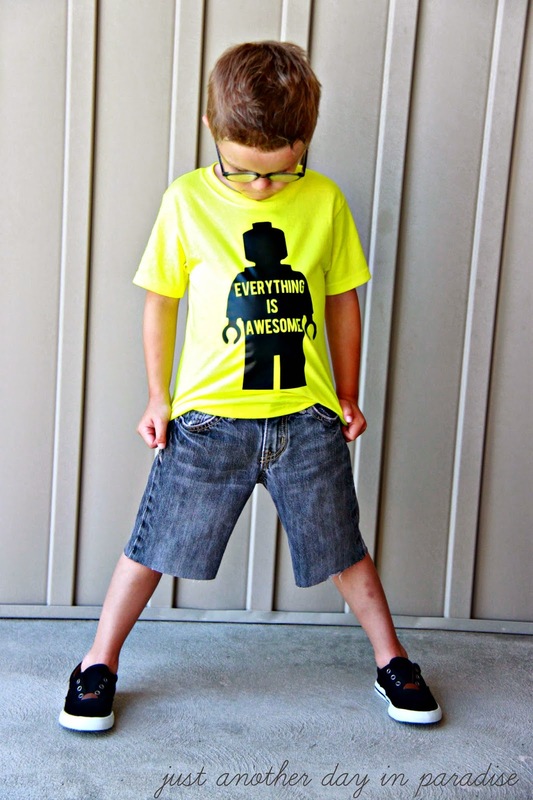 Which is how I dreamed up this Everything Is Awesome Lego T-shirt. I was chauffeuring the Little Men around as normal and as usual they were singing "Everything is Awesome...". When Bean suddenly chimed in it caught my attention because of how unbelievably adorable his little voice was. Then somehow brain went from hearing his adorable voice, to thinking that even he loves this movie, to they all love this movie, to I should document that somehow, to "put it on a shirt", and then finally to this shirt. how I am exactly what Weird Al is singing about in "Word Crimes". P.P.S If you haven't listened to that song you should. I digress. 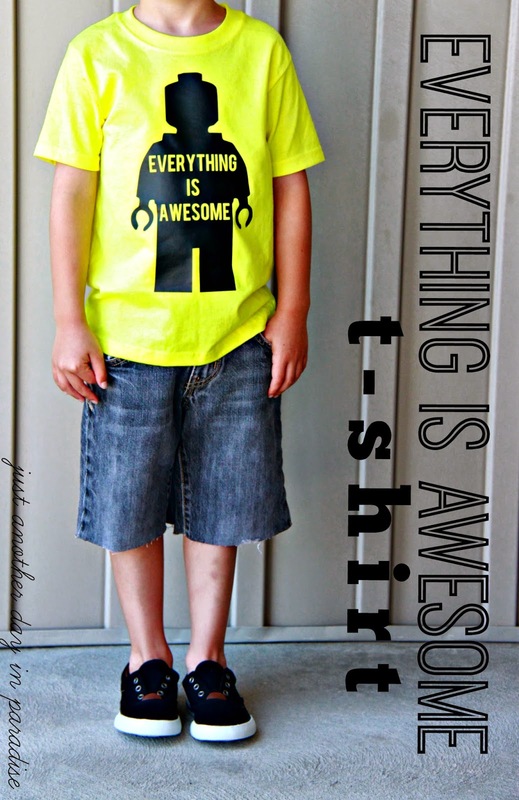 Back to the Everything is Awesome T-shirt. The yellow t-shirt is from The Mart. I used black heat transfer vinyl from Expressions Vinyl. I imported this Lego silhouette onto my Silhouette software. I typed text in the image using Bebas font, which is one of my favorite fonts to use for shirts. 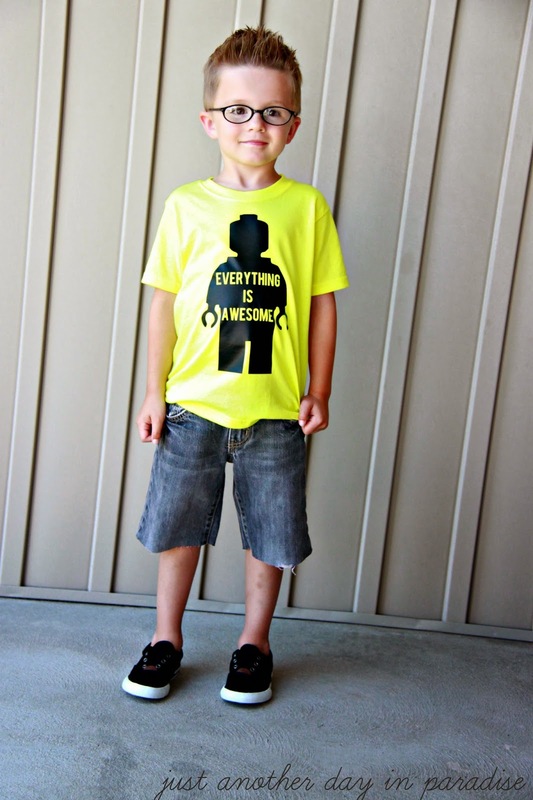 You can also do all of this using freezer paper like with this shirt. This shirt caused a lot of fights. 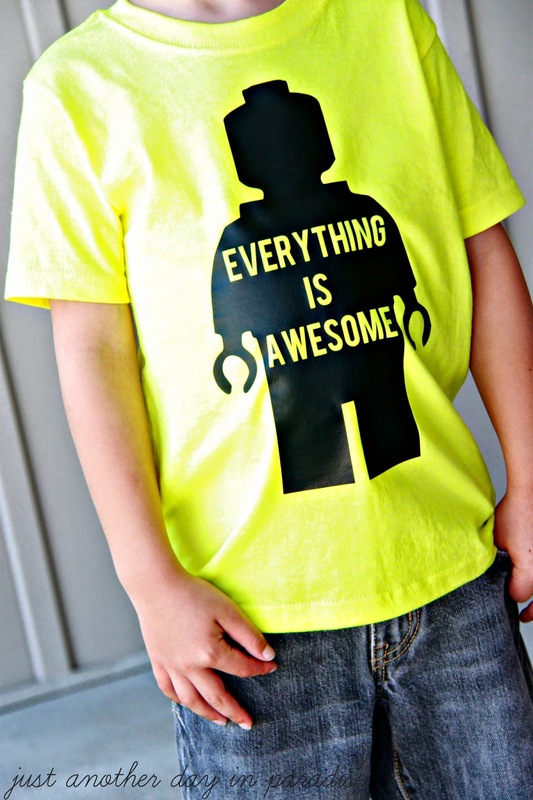 My older two were not happy that Little got this Everything is Awesome T-shirt. So now I have signed on to make two more. Ha. I told you my boys are obsessed. I guess I can't blame them. This is an AWESOME shirt. You knew that was coming. Ha! Most AWESOME shirt EVER (you know I had to go there, right!?)! :) Totally going to add something like this to my to-do list for the week! my boys would go crazy for this! I wish i had the stuff to make one, super cool! Go Mom!! This shirt is awesome! Love it! great idea! This shirt is awesome! My boy would love it. My oldest is OBSESSED with this movie. I'm pretty sure he can quote the entire thing by now. I'm definitely putting this on my "to make" list. Hooray for Silhouettes! Great idea, thanks! I have a 34 man child husband that will go insane for this shirt!! Where did you find the file? I found the Lego image on Google. I added the words to the image using an online photo editing program.